May 11, 2018 By Denny Hansen & filed under All Articles, Shotguns, Weapons. 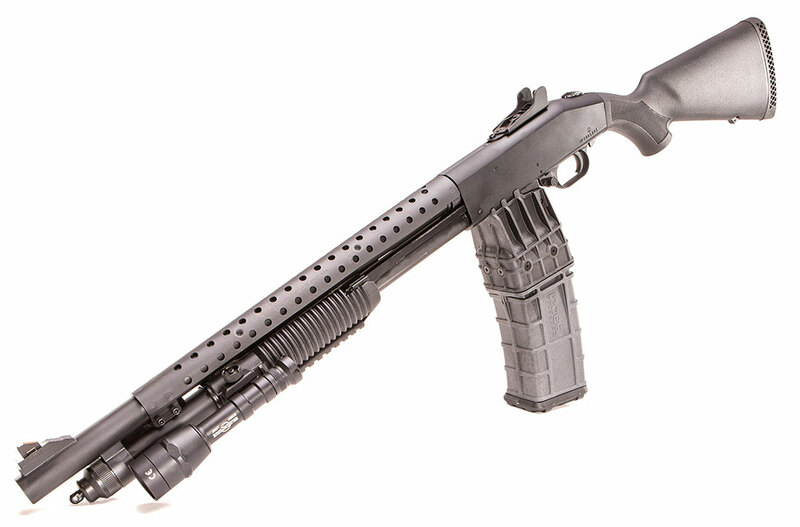 Mossberg 590M Tri-Rail Shotgun with five-round magazine in place. 590M TR with 15-round magazine in place. It’s actually shorter than a single-stack magazine that holds fewer rounds. As long guns are concerned, M4-type carbines currently reign as king. But no weapon is more versatile than the shotgun. It can use slugs, buckshot, birdshot, breaching, less-than-lethal, and chemical agents (such as OC), to name just a few. While there are many good self-loading shotguns, the slide-action (pump) is the undeniably the most reliable. A pump gun can use birdshot with boring reliability for training, but the light loads may not always cycle a semi-auto. Two valid arguments weigh against the shotgun: Its ammunition capacity is limited, and it can be slow to reload. But the times, as they say, are a changin’. Ambidextrous magazine release operates by rotating away from lip on back of mag. 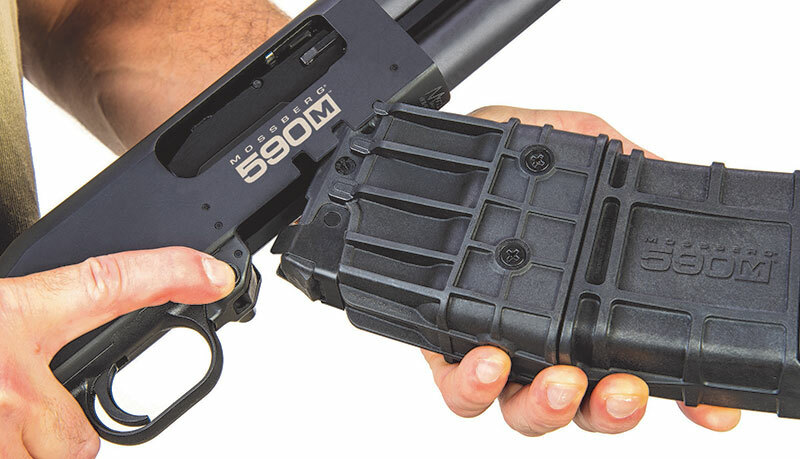 Mossberg has introduced two models of a box-magazine-fed shotgun—the 590M with bead sight, and the 590M Tri-Rail with rifle-type sights. Both models come standard with a 10-round magazine. This article features the 590M Tri-Rail. Rear sight is adjustable for windage and elevation. Ambidextrous safety on top is preferred by many shooters. 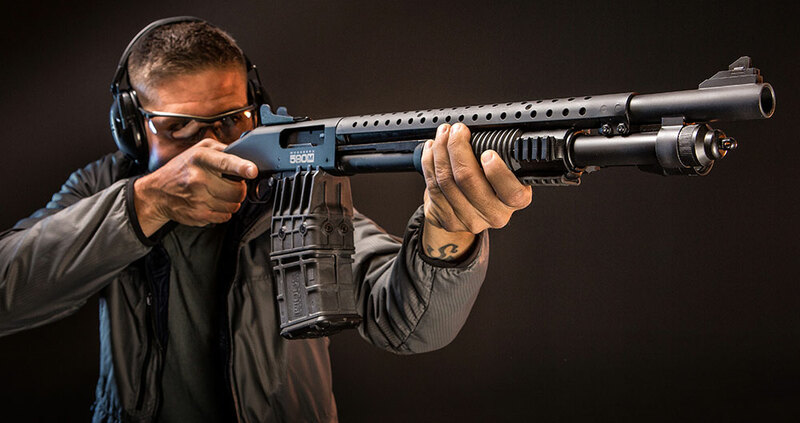 The features the Mossberg 590 series is famous for are all present in the 590M Tri-Rail (590M TR): dual extractors, twin action bars for positive lockup, ambidextrous safety and action release, heavy walled barrel, and drilled and tapped receiver. One difference is that these models do not have the metal safety and trigger guard of the 590/590A1. The 590M shotguns are for use with 2.75-inch shells only. As noted above, the 590M TR is fitted with rifle-type sights. The rear sight is of the ghost-ring type and is adjustable for both windage and elevation. The front sight is a post with a yellow insert on a ramp. The ramp is serrated to help reduce glare. A ventilated steel handguard sits atop the barrel. 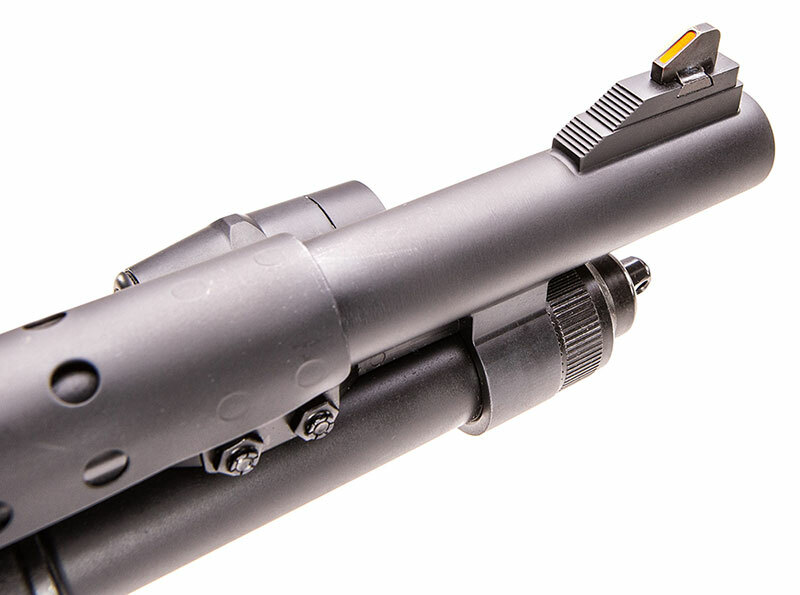 The cap on the forend tube is fitted with a sling stud. Front sight is dovetailed into serrated ramp. The synthetic stock has a length of pull (LOP) of 13.87 inches and is fitted with a rubber recoil pad. An integral sling loop is molded into the rear of the stock. The pistol grip area of the stock has molded-in checkering. The LOP is a bit long for me, especially during the winter months when I’m wearing heavier clothing. A stock that is too long for a shooter is one of the main causes of poor technique and also contributes to more felt recoil. If I were to purchase the TR, I would likely refit the issue stock with a shorter one from Mossberg or the Magpul SGA stock with the spacers removed to bring the LOP down to 12.3 inches. Rail on bottom of forend. Ladder-type rail cover (included) reduces abrasion to the hand. The forend has vertical grooves that won’t let the hand slip while being manipulated. Four-slot Picatinny accessory rails are located at three and nine o’clock and along the full length of the forend—hence the Tri-Rail designation. 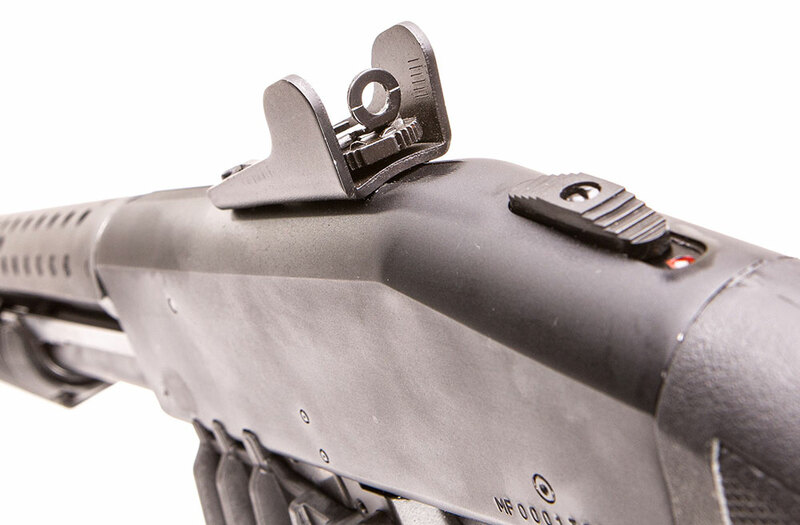 Mossberg includes a ladder-type rail cover for the bottom rail so one won’t have the “cheese-grater” effect while working the pump. The magazine release is right where Americans are comfortable with it—just in front of the trigger guard, where it can be manipulated with the fingertip. It’s located on both the right and left sides. Instead of engaging a notch in the mag, the release works by rotating away from the lip on the back of the magazine. Pistol grip area of stock has molded-in checkering, rubber recoil pad, and integral rear swivel stud. When coupled with the ambidextrous safety and slide release, this makes the 590M TR right at home for both southpaws and right-handed shooters.Notches machined into the bottom of the receiver match up with lugs on magazines. 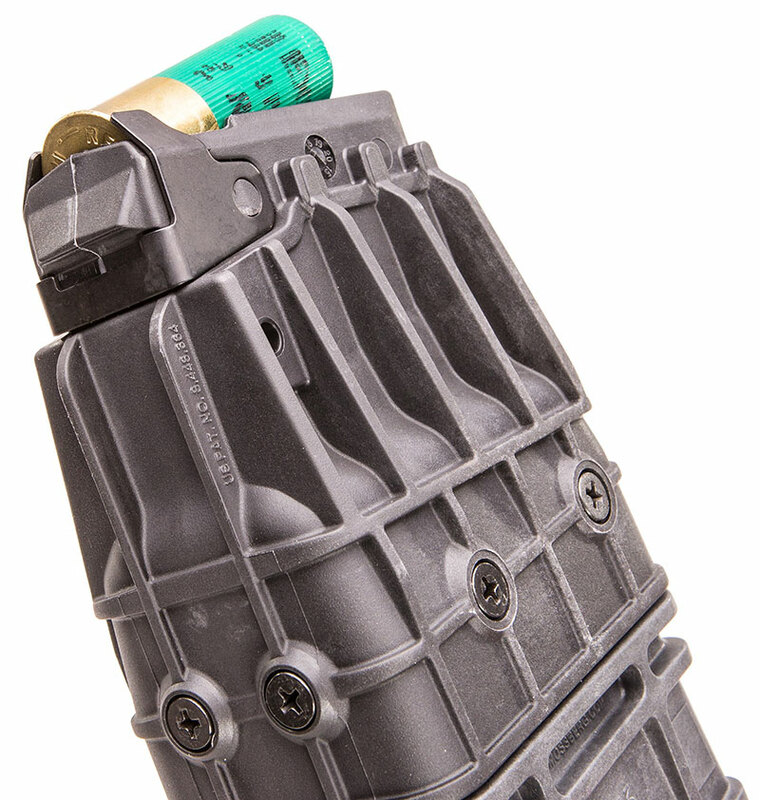 This not only ensures a very positive lockup, but also raises the top shell in the magazine to feed easily into the chamber. Although I did not perform any low-light shooting, I attached a SureFire M6001B Mini Scout light, because if I were to use the 590M TR for home defense, it would have a light mounted, and I wanted to shoot the shotgun as I would use it in a self-defense role. Ventilated heat shield runs from front of the receiver and extends past the forend. I also attached a two-point Vickers Sling from Blue Force Gear because any long gun—whether a carbine or shotgun—used for serious purposes should have a sling. 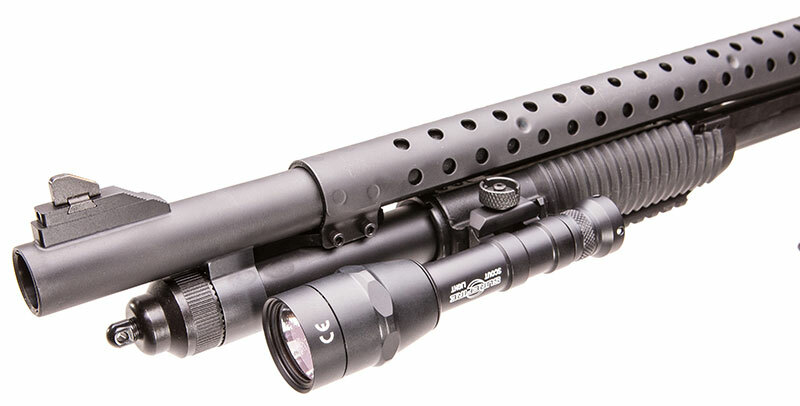 Author mounted SureFire M6001B Mini Scout Light on left forend rail. 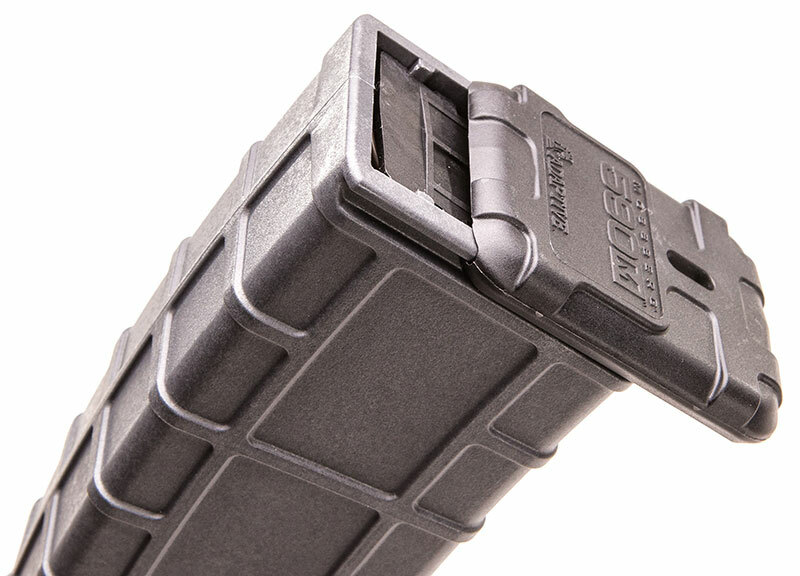 The Mossberg magazines are the world’s first production double-stack shotgun mags. The result is that round for round, they are noticeably shorter than competitors’ single-stack shotgun magazines. The magazines have hardened steel feed lips with over-molded shell ramps for sure feeding. The proprietary self-lubricating polymer body houses a magazine spring made of ASTM-A-228 music wire. A durable black oxide finish is applied to all steel components, and a removable floor plate facilitates easy cleaning. Finally, they have constant-curve geometry for sure feeding. Notches on receiver perfectly mate up with lugs on magazines. The magazine locks in place by inserting the front of the mag first and then rocking it to the rear, similar to the AK. The aforementioned notches on the receiver and lugs on the magazines match up perfectly and make inserting a mag a snap. There is a bit of a trick to loading the magazines. Unlike a smooth pistol case that allows one to simply push down and slide the cartridge back, the rim on the brass head of the shotshell somewhat prevents this. Rear of mag shows hardened steel feed lips and over-molded steel shell ramps. After inserting the first shell, place the rim of the next on the brass head of the first and then slide it home. Repeat until the magazine is full or the desired number of rounds have been loaded. Since the magazine is located at the center of the shotgun, it does not affect the balance of the gun and is not muzzle heavy. Removable floor plate on magazines facilitates easy cleaning. Extended magazines on 3-Gun shotguns often hold nine or 10 (sometimes more) rounds, and it is not unusual to see a mag tube extending beyond the muzzle. And while that’s not a big deal for the amount of time it will be used in a competition, I can say from experience that a muzzle-heavy shotgun, often holding it at the ready, will begin to fatigue most shooters in a shotgun class. While each shell weighs only a few ounces, by the end of the day those ounces add up to pounds, and those pounds add up to sore muscles. All 590Ms ship with one ten-round magazine. 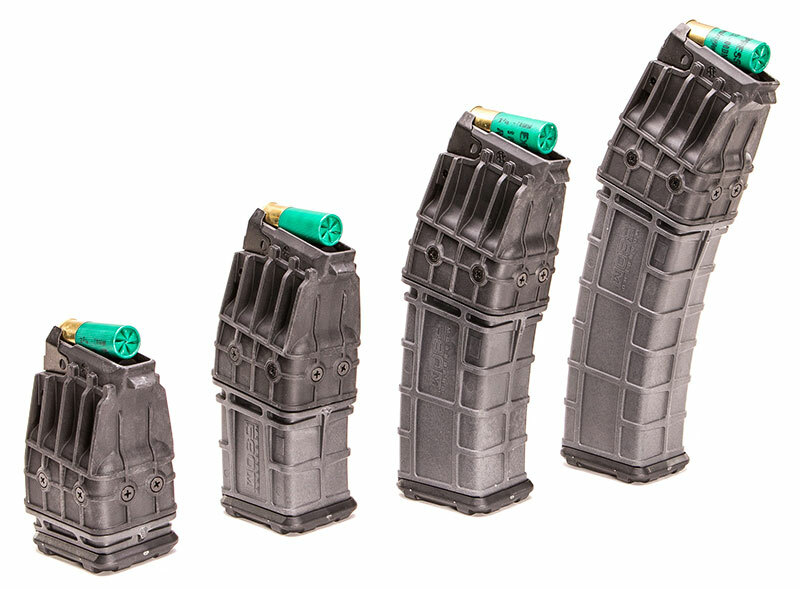 Available separately from Mossberg are five-, 15- and 20-round mags. The magazines are 2.5 inches long and 3.5 inches wide. The height varies from 5.3 inches for the five-rounder to 12.6 inches for the 20. I found that the 590M mags fit in a double M14 pouch with no divider. Another alternative is to carry the mags in a dump pouch. Left to right: five-, 10-, 15- and 20-round mags. Magazines can be marked with a label maker as to what type of ammunition is carried in them, e.g., slug, buckshot, birdshot. If loaded with less-lethal rounds, the magazine should be marked as to leave no doubt of what it contains—perhaps a wide strip of orange duct tape or painting the entire mag orange. Even with that, precautions must be taken to ensure that a lethal round is not chambered. Ambidextrous magazine release is perfectly placed and ergonomic. I arrived at the range with six buckshot loads, three different slug loads, and an assortment of birdshot. I started with the birdshot to get a feel for the shotgun. Whether using five-, 10-, 15- or 20-round magazines loaded to capacity, I found the balance to be very good due to the weight being in the center. Next, I evaluated the buckshot loads with my normal procedure. Stapling a B8 repair center target to the cardboard backer, I start at 10 yards and move back in five-yard increments. When pellets won’t stay within the scoring rings of the target, the previous distance shot at is what I consider the maximum effective range for any particular load. There is an old myth that buckshot spread roughly one inch per yard, and for the most part it is just that—a myth. While it may be true of some loads that perform poorly, my experience shows that no such sweeping statement can be made about all buckshot. I had taken some Sellier & Bellot buckshot shells to the range with me, but doubted they would function in the 590M TR since S&B shells are about a quarter of an inch longer—actually .22 inch—than standard shells. Sure enough, this minimal extra length was long enough to prevent them from fitting in the mag. Although the over-powder wad is an often-overlooked component in shotgun shells, the performance of Federal FLITECONTROL® and Hornady Versatite™ wads is one reason they remain top contenders. The best performer of the buckshot loads was Federal Tactical, followed by Hornady Critical Defense. The worst performance was from the Winchester military load, which threw three of its nine pellets completely off the IPSC target backer at 15 yards. And be assured, every pellet that misses the intended target has a lawyer’s name attached to it…. Slugs utilized were the Federal low-recoil one-ounce Hydra-Shok® rifled slug (LE127 RS), a Winchester rifled slug, and Winchester PDX1 Defender segmenting slug. The PDX1 is designed to separate into three segments on contact with a soft medium ,(like flesh), creating three separate wound channels. The slug loads were fired for groups at 50 yards from a bench. In order from best to worst, they were Winchester, Federal, and Winchester PDX. Achieving center hits on an IPSC target from standing at 75 yards was very doable. I was curious about the time it takes to reload the 590M TR. I loaded up with a 15-round magazine, carried a spare 15 rounder in an M14 double mag pouch, and used a PACT Club Timer to record the time. After two practice runs, I fired one round, did a speed load with the spare, and fired once more. Time was 4.58 seconds. That could undoubtedly improve with practice, but that’s still less time than it takes to fire a round and then load five rounds into a tubular magazine—but with three times the capacity! As expected, I experienced no surprises in regard to functioning, with the predicted reliability from a Mossberg pump shotgun. 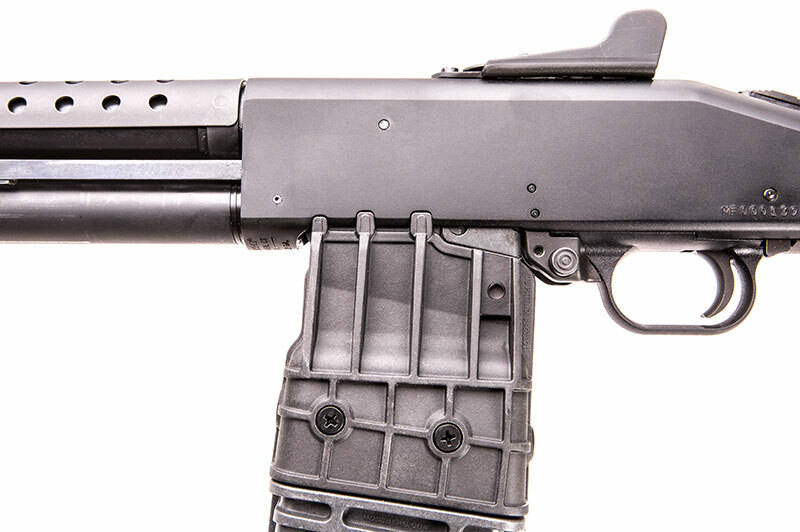 Although shotguns that feed from a box magazine are not new, the Mossberg 590M Tri-Rail takes them to a whole new level. To begin with, it is much more user friendly than what most shooters are accustomed to. For example, another shotgun uses a flapper-type mag release located at the far end of the magazine, and many shooters find it awkward. The Mossberg’s magazine release, as noted, can be manipulated with a push of the finger like an AR-type carbine, and all controls are fully ambidextrous. Next are the double-stack magazines, which are much shorter than the magazines of other shotguns with a similar capacity. Finally, the 590M TR is based on the proven Mossberg 500 action. Higher capacity, faster to reload, and ergonomic—what’s not to like?